Where is Martin County, NC? 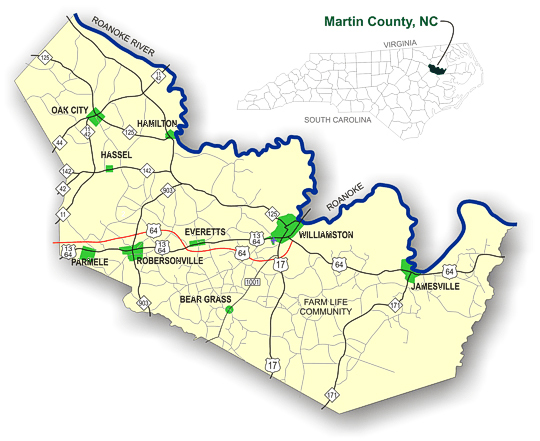 Martin County is located in northeast North Carolina, about 100 miles from the Outer Banks. The name Bear Grass, a type of yucca prolific in the area, has been in use at least since 1761 when it was given to the area’s major swamp in a land grant. The early settlers were farmers, with many engaged in the production of turpentine, tar and shingles from the area’s abundant forests. Records are limited, complicated by the fact that Bear Grass businesses were listed in directories with Williamston addresses because that was the nearest post office. But by the turn of the century, the community consisted of several legal distilleries, cotton gins, sawmills, grist mills and blacksmith shops. Reuben H. Rogerson’s two story steam-powered sawmill and cotton gin was one of the area’s largest before being destroyed by fire in November 1908. The first decade of the 20th Century witnessed considerable growth in the community. The town was officially incorporated on Feb. 16, 1909. An unusual physical feature of the town is that, when incorporated, the boundary was a circle with a radius of 500 yards from a white oak “near a well at the stores of Rogers Brothers and Cowing [sic] Brothers.” These limits remain today, making Bear Grass one of the few towns in the state laid out in this manner. Hamilton, incorporated in 1804 and located on the Roanoke River, long prospered as a bustling commercial port. Shallow-draft steamboats, the cotton gin and a burgeoning textile trade here and abroad brought river traffic to its peak during the years preceding the Civil War. After the Civil War, tobacco and peanuts replaced cotton as the area’s major commodity and another era of prosperity brought new steamers and barges to keep passengers, produce and merchandise moving up and down the East Coast. In Hamilton, residents were building the lovely Queen Anne homes and Gothic coastal cottages and churches that you see on a walk about town. Today, the river is a prime recreational resource, with a NC Wildlife Boat Ramp and parking area located at the foot of Main Street just down from Town Hall off NC 125. This wharf area was a hubbub of activity during the 19th Century, Hamilton’s heyday as a commercial port. Info from Historic Hamilton: National Register of Historic Places Historic District brochure, by the Historic Hamilton Commission Inc. And, Martin Architectural Heritage: The Historic Architecture of a Rural North Carolina County, edited by Thomas R. Butchko. Furthermore, the county’s important fishing industryâ€“including the famous “fishing machines”â€“ was centered here, particularly in the spring when runs of herring brought hundreds to the Roanoke River to obtain a supply of fish to salt and preserve. The C.C. Fleming Fishery on Stewart Street was the most successful, and stands today as the only important structure associated with the fishing industry in Martin County. Jamesville currently has the only riverfront restaurants in Martin County. The Cypress Grill is open seasonally when the herring run (usually January through April). The other restaurant is River’s Edge. The advantageous location of the original commercial district along Water Street near the river was lessened as travel relocated to the highways, and old commercial buildings were abandoned for new ones along what became US 64. In fact, only one survives on siteâ€” the 1914 (former) US Post Office The ca. 1900 general store of Henry Gray Griffin, located across the street from the old post office building, was demolished in 2003. Info from Martin Architectural Heritage: The Historic Structures of Rural North Carolina County, edited by Thomas R. Butchko. With the establishment of the “Goose Nest” post office in 1888, this community – which began in the early 1880s as a small, rural trading center around a collection of farmhouses – received its first official name. In 1905 the town’s name was changed to Oak City because a town citizen visiting Raleigh saw “Oak City Laundry” on a delivery wagon and liked the name enough to urge the General Assembly to effect the change. With farmers and traders attracted by the new Wilmington and Weldon Railroad service, Oak City enjoyed dramatic and steady growth during the early 20th century. By 1910 the population had more than doubled to 251 residents, and the town’s educational and religious offerings expanded to meet the growing needs of this area. While commercial activity included a number of general stores and boarding houses, the industrial activity consisted of saw and planing mills, as well as a grist mill. The proliferation of the automobile after the 1910s, accompanied by improvements in the county’s roads, brought significant changes to Oak City. Residents were now able to visit larger towns, so merchants gradually reduced their offerings to cover the basic needs of locals. The end of passenger rail service in 1939 brought about an end to that chapter of town history. Today, the town remains a strong community in northwestern Martin County, with NC 125, NC 11 and NC 42 converging to bring visitors through town. St. Mark’s Missionary Baptist Church, organized in 1883 as the 1st church for African-Americans in Goose Nest Township, is also located in the Oak City area but underwent considerable remodeling in 1968. The two most important developmental forces in Martin County, the arrival of railroad transportation and the proliferation of profitable lumber mills combined to become major catalysts for the birth of Parmele. The Wilmington and Weldon Railroad began construction around 1890 to extend its north-south line down through Martin County on a location near the Parmele-Eccleston Lumber mill. This chosen tract of land centering on the Albemarle and Raleigh Railroad developed so rapidly after the line was completed that on February 14, 1893 the General Assembly incorporated it into the town of Parmele. In 1895, a third railroad line was extended from Parmele southeasterly to Washington making this newly-formed town the junction of railroad lines leading in five directions. By 1896 it had two lumber mills, ten general stores, one confectionery, and a population of 200 residents. A devastating fire in 1904 destroyed much of the town’s business sections along the railroads and, along with the declining available timber, may have accounted for the closure of those two lumber companies. During the 1910s Parmele became noted as the location of a very successful industrial institute for African-American children. Directed by Dr. William C. Chance, the institute taught not only academic learning but also agricultural, mechanical, and home-making skills. After a merger with the town’s public school, the Parmele Industrial Institute was moved into the first brick school building erected for either race in Martin County. The institute achieved regional acclaim, eventually occupying a six-building campus. Unfortunately, the main structure was destroyed by fire in 1954 causing the school to be consolidated into Robersonville’s public school for blacks. Parmele still seemed to thrive on the commerce brought to it as the juncture of three railroad lines, and despite an increasing reliance on automobiles and trucks after the 1910s, the town’s population grew or remained steady during the mid-20th century, peaking to 417 in 1940. Though improved state highways soon avoided what was left of the old commercial section, the town continues to supply its residents with basic goods through the presence of a general store. The railroad tracks serve as mute testaments to Parmeleâ€™s railroad heyday. Incorporated February 1870, Robersonville – located directly on the railroad’s route between Tarboro and Williamston – is the first town in the county dependent on the railroad, rather than the Roanoke River, as its chief commercial and communication link with the world beyond Martin County. 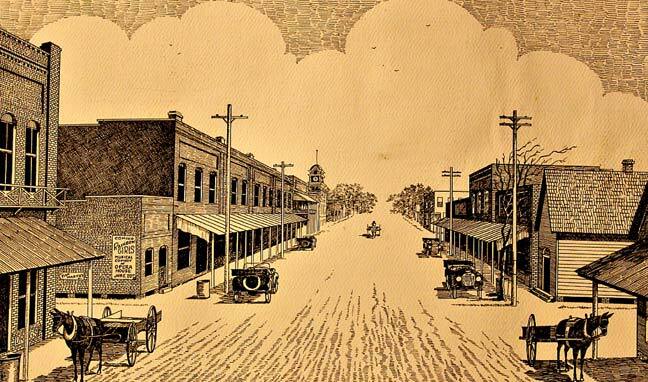 Although the Seaboard and Raleigh Railway Company would not be incorporated until late 1873, town founders envisioned it as a prominent trading center and market for western Martin County. Growing slowly during its first decade, the town quickly fulfilled its destined fate after the railroad’s completion in October 1882 and boasted having eleven general stores, two physicians, and a number of industries by 1884. The town’s population had increased in 12 years to 400 residents with farm families and ambitious young men moving there because of its various entrepreneurial, educational, and social opportunities. As site of the county’s first tobacco market in August 1900, Robersonville embarked on a second, more expansive era of prosperity, civic progress, and development with a population that surged up to 1200 during the early 1900s. The growth of new industries brought new residential areas which opened to provide homes for the town’s increased population – most notably “New Town,” a residential neighborhood that would become one of eastern North Carolina’s most cohesive and civic-minded early 20th century African-American communities.